My previous recipe for perfect fluffy rice was heavily reliant on a microwave. I was recently asked how to obtain the same results using a cooker and so here is the recipe. As with the previous method this does rely on you learning to trust your own judgement and so don't be upset if it doesn't work first time. Once you've cracked it, it won't go wrong again. Soak the rice in a bowl for 20 minutes. You will notice that the water has turned a cloudy white colour. This is the starch from the rice. Drain away the water. Cover the rice with water again. Stir the rice and watch as the water turns white again. Drain immediately and then repeat this step a further two times. The water will still be turning cloudy as there is still starch in the rice but you will have removed a large amount of it. You do need some starch in the rice to stop it disintegrating. 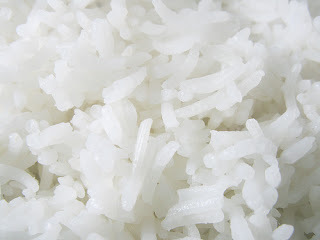 Place the rice in a small saucepan and add enough water to cover the rice by approximately 1 cm. Add the salt to the pan and stir well. Heat the rice on a medium heat until it comes to the boil. Now turn down the heat to low and put a lid on the saucepan and let it simmer for 5 minutes. Stir the rice occasionally and check that it hasn't burnt dry. If it is looking dry, add more water. Stir the rice gently and note how much water is in the pan. If you push the rice to one side of the pan, there should be a reservoir of 1-2 teaspoons of water at the bottom. If there is more than this, drain it away. If there is less, add a little water. Now partially cover the saucepan and heat for a further 1-2 minutes on a low heat. At this point the rice should be fluffy and perfectly cooked. If it is still wet, drain away any excess water. If it is too dry (it will be looking overcooked), add a little more water. In both cases partially cover the saucepan and heat on low for another minute or two and then repeat this step until perfect.